Leading Manufacturer of prefabricated porta cabin, prefabricated executive cabins and prefabricated portable cabin from Thane. Our organization has successfully expanded its business in market owing to the offered elevated quality array of Prefabricated Executive Cabins that are mainly used at construction sites. 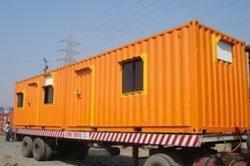 These small and spacious cabins are high in demand and are can be easily installed. Moreover, a team of our quality controllers conducts a series of quality tests on the entire range to seek out any possible defect. In tune with industry set standard, we provide the entire range of cabins in various sizes and at industry leading prices. 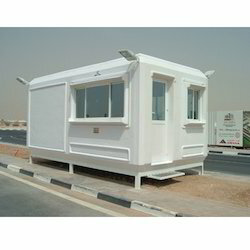 We are an acclaimed name engaged in offering our precious clients a superior quality range of Prefabricated Portable Cabin. Mainly used for making temporary offices at different sites, this cabin is constructed in synchronization with industry standards. In order to ensure quality, the entire range is rigorously tested on various parameters by our quality controllers. Keeping in mind the diverse requirements of our clients, we provide the entire range in various sizes and specifications and at affordable price.